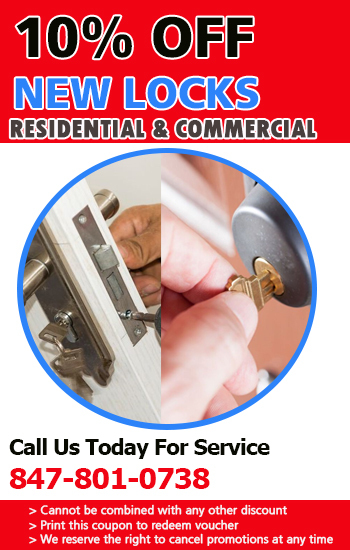 We are commercial lock change experts, offer top-notch residential locksmith services, have the best auto locksmith team in Illinois and provide emergency lockout service 24/7. We repair locks and keys fast, rekey master locks and fix car key chip problems. Improve the security of your home, office and car with the specialist solutions of "Locksmith Palatine". Our company is a leading provider of lock and key services ranging from installation to repair, rekey and replacement. Rely on us to provide emergency assistance 24/7. Our mobile team does everything from fixing damaged locks and replacing transponder keys to providing lockout assistance and emergency trunk opening. As part of our scheduled services, we carry out large and complex projects from the setting up of master key systems to the installation of safes. Our specialists will do everything necessary to make your property as secure as it has to be. * Repair - We fix locksets and keys of all types and brands including ones which have electronic components and use digital technology. When a component such as a cylinder or a screw has to be replaced, spare part of the highest quality is used for achieving the best result. * Rekey - In case of lost house keys, the lock is rekeyed so that the person who finds them will not be able to get inside. Our technicians will change the pin configuration of the cylinder and ensure smooth operation of both the lockset and the new keys. * Replacement - When lock repair will not resolve the problem, our specialists will replace the lockset with a new one. You can readily opt for a more advanced device for getting even higher security. All of these services and more are available on an emergency basis at Locksmith Palatine. We answer the phone quickly and arrive shortly regardless of your location or the time of day. Even the most specific and complex solution is implemented on the spot. If you are locked out of your vehicle because of a lost or broken ignition key, our technician will deliver a precisely matching replacement unit with the same functionality and perfect strength and durability. You can hire our office, home and auto locksmith services by appointment too. Our company has extensive experience in projects for lock upgrading, ignition change and overall security improvement. To ensure that you will get excellent results, we can run an assessment and help you with the selection of the new locking devices before fitting them. Our professionals are always open to answering questions and giving advice to our customers. Leave us a note or give us a call for more information. We are always at your service.